Drew McDonald (34) goes up for a shot during the game against Wabash. McDonald had 10 points on the game. After helping the Norse to their best start (6-0) in the Division I era, Drew McDonald’s 22-point performance was no match for the University of Central Florida and their 7’6″ blocking specialist Tacko Fall, the Norse suffered their first loss of the season on Saturday night, 66-53. Last weekend’s Maui Invitational winners (UCF) began the second half on a 23-6 run (51-36) and extended that cushion to as many as 19 points before coasting to their fourth-straight victory. In addition to McDonald, Tyler Sharpe tallied 13 points and five rebounds, while Walton finished the night with 11 points and five rebounds. Jalen Tate did not participate in Saturday night’s contest due to an unspecified injury. Though the Norse held the Knights to 9-of-24 (37.5 percent) shooting, including 3-of-8 (37.5 percent) from beyond the arc in the first half, it still wasn’t enough as the senior center Fall from Dakar, Senegal scored 11 of his overall 20 points and snagged four rebounds in the half to give the Knights the lead 34-32 headed into break. McDonald highlighted the first half as he shot 4-of-7 from the floor, including 3-of-5 from three-point range to lead all scorers with 13 points. He also added four rebounds and two assists, while Walton added nine points. 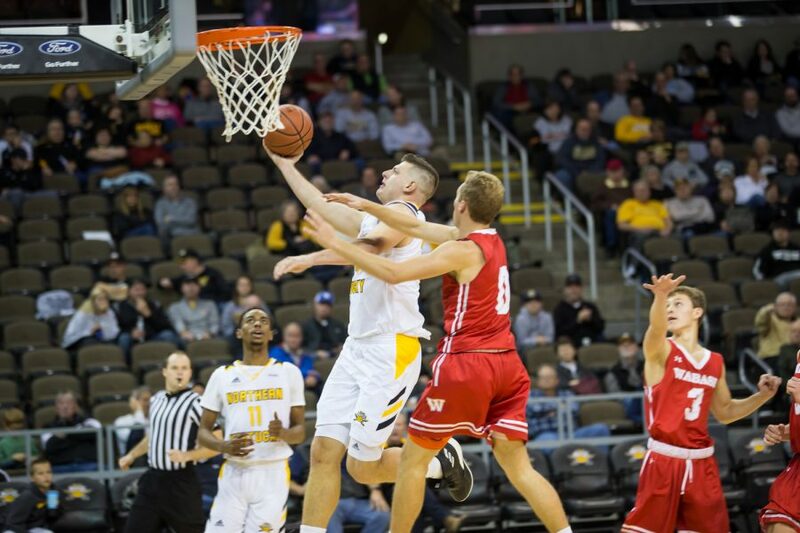 The Norse came into Saturday night’s contest averaging 85.7 points per game but were held to under 60 points for the second time this season. The Knights clamped down and held them to just 19-of-59 (32.2 percent) shooting from the field and 8-for-31 (25.8 percent) from beyond the arc. The Knights also out-rebounded last year’s Horizon League regular season champs 51-35 and outscored them 14-5 in second chance points. With the loss, the Norse dropped to 6-1 overall, while the Knights improve to 5-1 on the season. The Norse will be back in action on Tuesday, Nov. 27 as they hit the road to Morehead State for a showdown with the Eagles. Tipoff is scheduled for 7:30 p.m. and will be broadcasted on ESPN+.